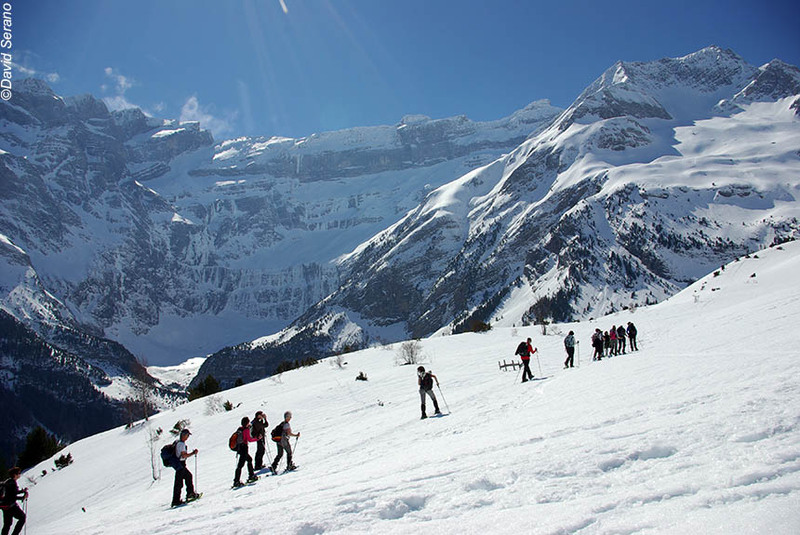 Truly memorable yet remarkably easy, guided snow-shoe winter walks that feature some of the most iconic mountains and valleys in the Pyrenees - especially in winter - not least the UNESCO Heritage site of the Cirque de Gavarnie. You stay in a wonderfully authentic, yet fully modernised, farmhouse rather than anonymous hotel. 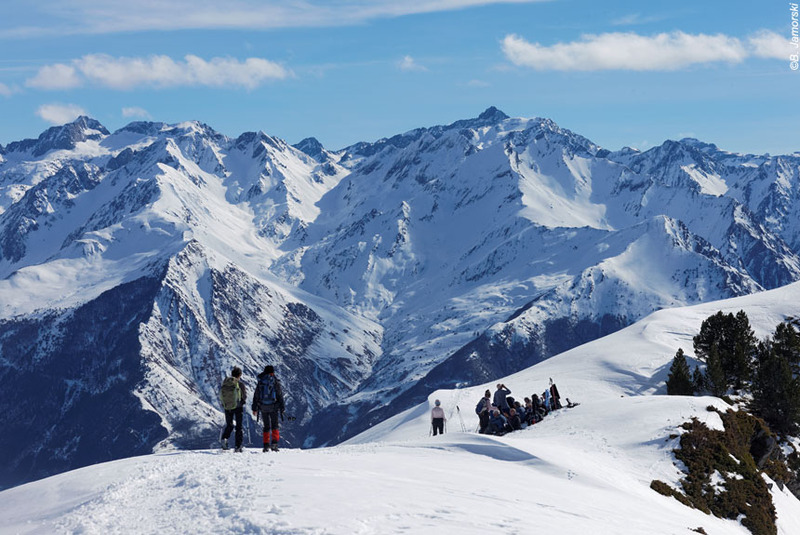 Perfect for anyone who loves walking, mountains and snowy landscapes, this holiday uses snow-shoes to enable you to easily and comfortably discover wonderful paths, frozen lakes and waterfalls, high peaks, the inspirational tranquillity of the Pyrenees and its jaw-dropping beauty. In a small group with an English speaking guide, you reach places others simply can't and don't visit in winter. And the accommodation...? Well, it's one of our favourites in the whole of the Pyrenees because of its location, character, hospitality and cusine. Saturdays: we meet you at Lourdes airport to take you to our hotel in Lourdes for this first night, or if you arrive by train (fast services), you can simply walk the 50 metres to the hotel. You are then free to explore the historic city of Lourdes. If you arrive at Toulouse, then we recommend taking the train or hiring a car, although we can arrange a private transfer for you. You can choose to arrive in Lourdes on Sunday (with the price lowered accordingly). Until 18.30 on the Sunday, you are free to explore the city, walk in the surrounding hills (we supply detailed route instructions, and usually they are snow-free). Then you are taken to your accommodation for the next six nights where you will meet your your English speaking guide, and the other group members (minimum 5; maximum 15). You are fortunate to be staying at one of our favourite places in the whole of the Pyrenees. Why? Well, four main reasons: Les Gerbes has a magnificent location with inspiring panoramic views across the beautiful Gave valley - one of the most attractive valleys in the Pyrenees; it is an historic Bigourdian farmhouse that has been completely yet sensitively modernised to provide the best possible mix of old and new; you have free access to the jacuzzi in the evening, the hospitality and the cooking are not only exceptional, they are just what you want and expect in French mountains in winter; it is excellently located to proivide easy access to some of the very best winter walks in the Pyrenees. It is not an "hotel", and we think all the better for it. This is among the best of authentic Pyrenean accommodation, and you will have the chance to see how accurate this description is before testing the cuisine with a special first night gastronomic experience. After breakfast, you can have a snow-shoe lesson with your guide. Unlike every other forms of snow travel, snow-shoeing is easy to learn (spoiler alert: it's walking! ), quick to master, and not much more tiring than ordinary walking. That's why you'll be eager to get started. You are taken to start at a magnificent location: the 4,500 feet high col de Soulor, a feature of the Tour de France, yet for winter walking it offers fairly level high altitude walking with marvellous panoramic views all around including, far below, the plains of Pau, nearer the traditional villages of the Azun valley, and, way above, the peaks of the Pyrenees. In fact, your total ascent is under 1,000 feet. It is a real pleasure and a privilege to be walking on this circular route to Soum lake and the mountain refuge of Cantau because, simply, you'd never dare to discover it without a guide. 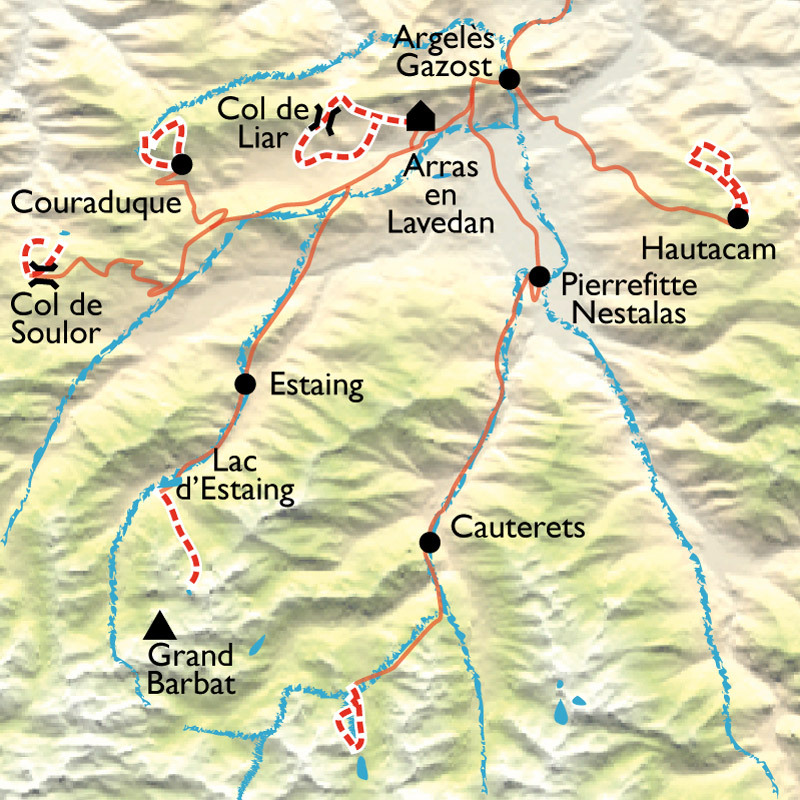 Yet this is a comparatively easy walk lasting upto 4 hours with frequent stops, and a picnic supplied by Les Gerbes. All the same, you will appreciate the comfort and warmth of Les Gerbes before tucking into a well earned dinner. Today your walk starts at the beautiful high altitude Estaing lake with pine forests and some of the Pyrenees' highest summits reflected in its waters - if it's not frozen over! Here you are walking in the highly protected National Park of the Pyrenees, and will follow tracks through pine forests, along open valleys, and beside streams and waterfalls (probably frozen to provide excellent photographic opportunities). Your guide leads you gently to an especially high valley - the Ilhéou - dwarfed by the granite heights of Grand Barbat and Maleshores among others. It's an inspiring and very satisfying walk, but, again, will last no longer than 4 hours, and the total ascent is only a little more than 1,000 feet. Les Gerbes will welcome you back. 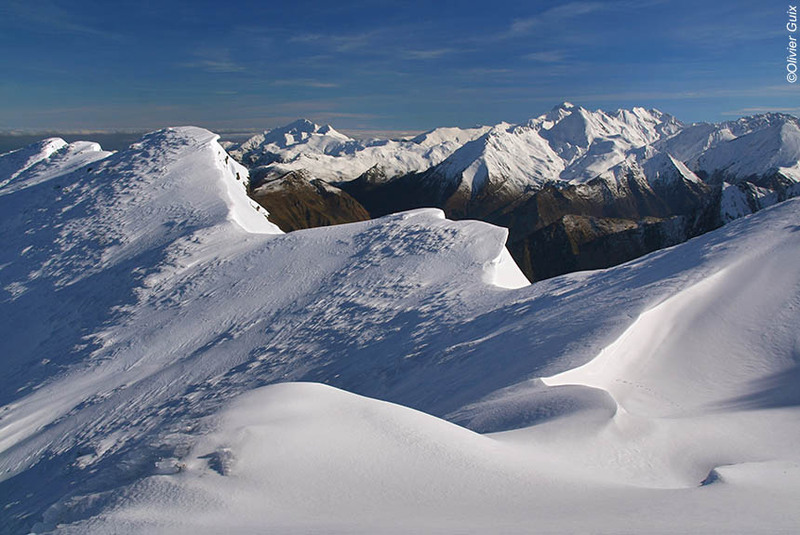 Today you will enjoy a comparatively easy walk (3 hours or so, and around 1,000 feet of ascent/descent), but discover some of the many joys of snow-shoe walking - not least going to places the vast majority of people don't/can't visit in winter. You start at the high arched stone-built Pont d'Espagne where you will see the first of many frozen waterfalls that often look more like dramatic ice sculptures. You walk up beside streams and through pine forests to reach the legendary Gaube lake dominated by the pinnacle that is Vignemale - 10,000 feet high, and the highest mountain in the French Pyrenees. The lake will be frozen, and everything snow covered. It really does look like virgin territory. By now, Les Gerbes feels like home in the very best senses. 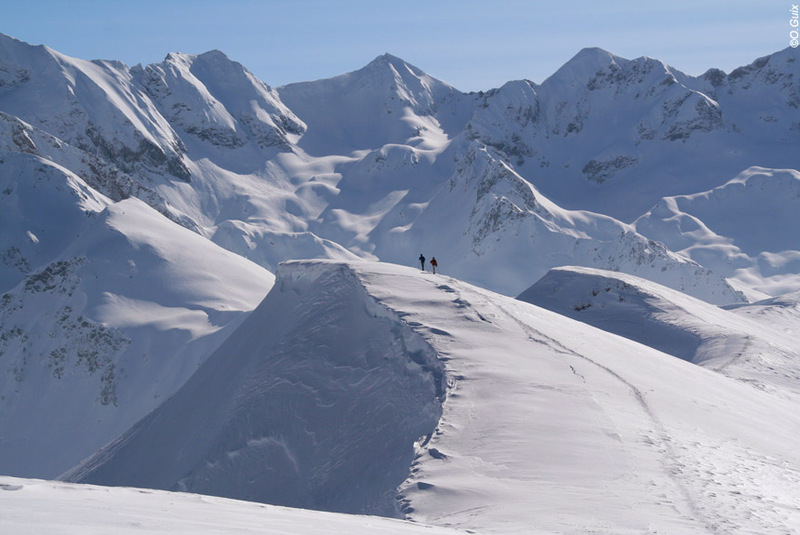 Hautacam is a renowned Tour de France destination, and a downhill ski resort at well over 5,000 feet - but that's not why you are here today. Now you've got your snow-shoe legs working well, there's a little more ascent/descent today (still less than 1,500 feet), but absolutely worth it primarily for the incredible views. You walk along ridges with amazing views all around including the mesmerising Pic du Midi, other major summits (your guide will identify all of them for you) and the lovely in summer/dramatic in winter heart shaped Isaby lake. You may be reading this thinking "what? More peaks, lakes and snow?" but you won't when you are there we promise! A hint of sadness creeps in as this is your penultimate night at Les Gerbes. Yes, we admit it. We have kept the best til last. Your walk takes you gently up to the Saugué plateau for your first sight of the magnificent Cirque de Gavarnie. Victor Hugo called it the colosseum of nature, an understatement when you stare wonderstruck at the 4,900 feet cliffs and 1,300 feet waterfall (the second largest in Europe) - frozen in winter, of course, and arguably even more dramatic as a consequence. It makes you feel rather insignificant, but also very privileged as it is not somewhere you can visit in winter without a guide. However, there is no wonder at all that this is a UNESCO Heritage site. You walk across the well named Bellevue plateau as well as the La Prade plateau before returning to the village of Gavarnie. 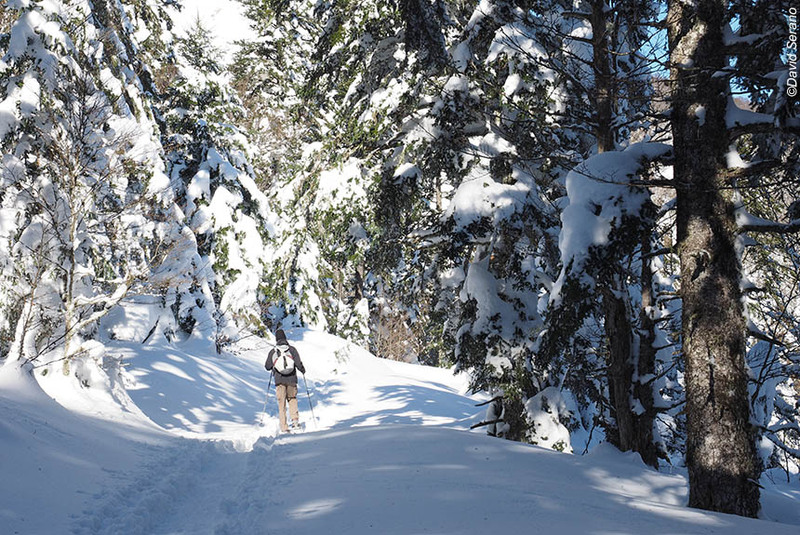 Your last snow-shoe walk ever? We doubt it! Your last night, and a final gastronomic dinner to say au revoir to your guide, your new found friends, and Les Gerbes. Sunday meeting point: whichever way you travel or day you arrive, the meeting point is at 18.30 in front of Lourdes railway station where you will meet your guide, and be taken to the holiday accomodation. On the Saturday at the end of the holiday, we will get you to Lourdes train station by 09.00, and Tarbes-Lourdes airport by 09.30 in time for the London flight. Each day the time spent on your snow-shoe walking journey will vary between 2 and 4 hours including rests etc. The total daily ascent/descent will range from 300 to 450 metres (900 to 1,500 feet). This is far less than a summer walking holiday, and is intended to be comfortable for anyone who can walk for 4 hours or more in hills and valleys. Les Gerbes is a wonderfully located, superbly modernised, authentic Bigourdian farmhouse that has been awarded 4 "chambre d'hotes" stars. The charming bedrooms have double or twin beds, and private bathrooms with shower. Downstairs there is an attractive lounge with bare stone walls, locally made wooden furniture and, importantly after a day's walking, a bar! In a cabin on the terrace is a jacuzzi for you to enjoy when you please - after the walk is pretty popular as you might imagine. Meals: continental style breakfast at the Lourdes hotel, and each morning thereafter (copious quantities!). There will be special dinners on the first and last nights at Les Gerbes, and on other nights meals consist of locally sourced traditional dishes with contemporary twists. Wine and coffee is included with each dinner. Hotel supplied picnics for each walking day are also included.